Aw, man, what happened to it? I can't help but find irony in the fact that, whatever their reason, somebody did that because they liked this radio! Anyway, this rather modest console was actually one of those designed to be paired with the rather extravagant (even then) TT-5 television attachment. 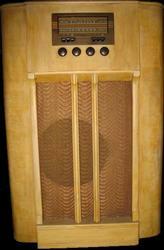 Throw in a bakelite "RCA Victrola" and voila, a component system, prewar style!